It was the firm belief of legendary Dramatist, renowned Actor, Lyricist, Translator and Author late Henry Jayasena, Shakespeare’s memorable phrase” All that live must die passing through nature to eternity” and “to every man upon the earth death cometh soon or late”. He, who possessed an effervescent personality, initially standing tall on the modest unsophisticated Lumbini Theatre in the early 1960s. He had confessed numerous times as a much-adored artiste that his heart lies in theatre. Henry Jayasena’s final curtain call was on the 9th November 2009. He could be easily classified as one, alongside amongst the elite of eminent literary figures in the annals of theatre in Sri Lanka, like Professor Ediriweera Sarachchandra, Sugathapala de Silva, Dayananda Gunawardena and Premasiri Khemadasa. His abundant aids to the theatre and cinema spanned for almost four decades. He retired from his acting career in the year 1999 while he was under treatment for dreaded colon cancer. The entire treatment process took around one and a half years. On his personal experience and suffering he had written in detail a book titled ‘Balha Gilano – the story of a cancer patient’ purely to educate the masses. After which he lived for a further 10 years leading a normal life during which time he revived his famous drama “Hunuwataye Kathawa” an adoption of Bertolt Brecht’s ‘The Caucasian Chalk Circle” by deploying experienced and talented new actors along with a few who were involved earlier in the likes of Nimal Jayasinghe and Chula Kariyawasm. The role of judge ‘Azdak’ is splendidly portrayed by Nalin Pradeep Uduwela while that of ‘Grusha’ by Ruwini Manamperi. Henry Jayasena was born on July 6, 1931, in a village called Bendiyamulla in Gampaha. He was the youngest in a family of six children, four elder brothers and a solitary sister. His father was Albert Rodrigo Jayasena who was once the private secretary to Sir Solomon Dias Bandaranaike was a well-versed person. He grew up in the rural hamlet of Bendiyamulla, was initially educated at the Gampaha branch of Lorensz College exposing him to both catholic and Buddhist cultures taking an active part in both church and temple activities, subsequently at Nalanda College, Colombo. It was late Dr Gunapala Malalasekera an eminent Civil Servant who first predicted a prodigious future for him in the field of acting after the famous educationalist observed the talents of little Henry Jayasena while acting in a school concert at Nalanda College. Since leaving school he opted for a career as an Assistant Teacher of English in the year 1950 at the tender age of 19. He initially ventured into stage acting by producing the drama ‘Janaki’ in the same year while he was a teacher. As he wanted to pursue a career in the Government service, he got through the General Clerical Service Examination and secured a job at the Public Works Department (PWD). While working in the PWD with his immense innate creative ability he was able to produce a number of new plays The first of which was ‘Manamalayo’ in the year 1953, then ‘Vedagathkama’ in 1954 and ‘Paukarayo’ in 1959. Then the vastly improved Dramatist created ‘Janelaya’ and the famous ‘Kuweni’ in 1962. Subsequently he produced ‘Thavath Udesanak’, ‘Manaranjana Wedawarjana’, ‘Ahas Maliga’, ‘Hunuwataye Kathawa’, ‘Apata Puthe Magak Nethe’, ‘Diriya Mava Saha Ege Daruwo’, ‘Makara’,(The Dragon) ‘Sarana Siyath Se Puthuni Habha Yana’ in the years 1964, 1965, 1966, 1967, 1968, 1972, 1973 ,1975 respectively. With these creations Henry Jayasena became a household name in Sri Lanka owing to the massive revolution he made in the field of creative arts. As a gesture of appreciation for his contribution towards literature, theatre and music, Henry Jayasena was honoured by the OBA of his ‘Alma Mater Nalanda College’ by conferring on him the title of ‘Nalanda Keerthi Shri’ on September 27, 2003, which was given for the first time was a timely gesture towards honouring one of Sri Lanka’s prodigal sons who coincidentally happened to be himself a Nalandian. It is also interesting to note that the actor received the award at the “Malalasekera Hall” of the school, named after the first principal of Nalanda College late professor Gunapala Malalasekera. The media Secretary of the organizing committee said that the idea behind this award was to honour their past pupils, who have emerged as distinguished personalities in society by serving and nourishing various arts with their many talents. It was under the guidance of U A S Perera at Nalanda College that Henry Jayasena and many other students made their way into the theatre and other fields of Arts. Henry Jayasena’s debut in films was in Sri 296 in the year 1959. During the 1960s he acted in several films. The part of Piyal opposite Punya Heendeniya became an award-winning role in 1964. 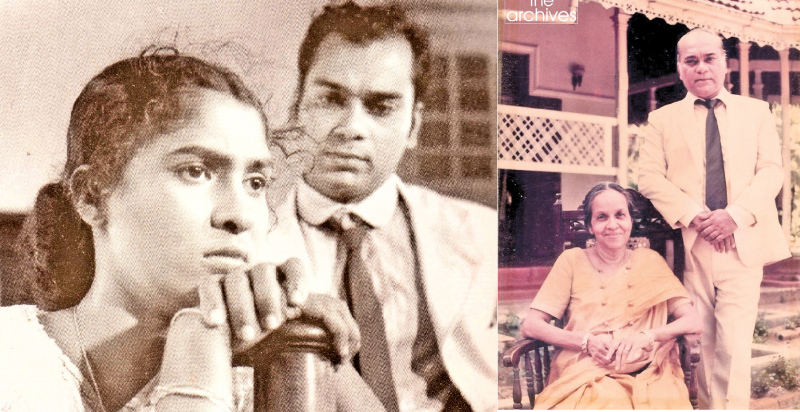 Then he portrayed the role of Lalith in G D L Perera’s ‘Dahasak Sithuwili’ in 1968. He played vivid roles in ‘Hansavilak’, ‘Gehenu Geta’, ‘Kaliyugaya’, ‘Raththaran Neth’, ‘Wena Swargayak Kumatada’, ‘Suhada Sohoyuro’, ‘Heta Pramada Vedie’, ‘Beddegama’, ‘Soldadu Unnehe’, ‘Kaliyugaya’, ‘Ammai Duwai’ and ‘Sandakada Pahana’. Some of the roles portrayed by him in the above films were leading characters, while in some others they were supporting roles. In each role, he very clearly demonstrated and proved his prowess as an actor. He created a further image in society through his portrayal of “Sudu Seeya”, the isolated intellect in “Doo Daruwo’, the much acclaimed Tele-Drama. Henry Jayasena retired from Government service in the year 1975 to devote his entire time for the Theatre and Arts. Before he retired, he had held the positions of Deputy Director of the National Youth Services Centre (Arts and Sports Division) and at the Sri Lanka Rupavahini Corporation ,Programs Division. Late Henry Jayasena will remain a model in the field of Art and Culture and as a most influential Dramatist of our times. There is no doubt that his enduring works in theatre and his diverse performances in cinema and television persist as a rich cultural legacy of the nation. It should be the wish of every follower of the theatre and arts that the incredible efforts of late Henry Jayasena rendered to these fields would be sufficient enough to shorten his life through Sansaric circle until he attains Supreme Bliss of Nibbana.